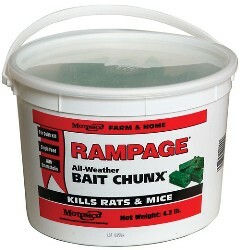 Rampage All-Weather Bait Chunx is a fast-acting rodent bait that controls rats and mice quickly using a powerful active ingredient. Rats and mice stop feeding after consuming a lethal dose, conserving bait allowing for maximum rodent control. These standard size Bait Chunx can be placed in a bait station to make for a more controlled extermination. With Rampage Baith Chunx you experience results in 1-2 days. Cannot be sold or shipped to Alaska, U.S. Territories or International export.